In January 2004, my wife and I jetted off to the land down under. The trip to Australia was primarily a vacation, but also coincided with a major poker tournament hosted by Melbourne’s Crown Casino (a five-star hotel that lives up to its billing). The “Australasian Championship” featured a $10,000 Aus dollar (about $7,200 U.S.) buy-in no-limit Hold’em final tournament that’s considered one of the most important events on the European Poker Tour. About 130 players entered the three-day main event. After day one, I had about doubled up, and was in good stead. Late in day two, with 22 players remaining, I was in full-control of my table and running quite smoothly with $70,000 in chips when I faced a perplexing hand. With the blinds (required bets) at $1,000 and $2,000, and the antes at $300 a player, I opened for $6,500 with Ad-10d. I was called by a local player, and immediately thought that he had a pair somewhere between 10s and 2s, or A-Q. I read him for a strong hand because everyone at that table seemed to be afraid to play even a semi-strong hand against me. The flop came down 8d-7d-2s, and I immediately checked. I had flopped a powerful hand, an ace-high flush draw (I needed one more diamond card) and two over cards (“over cards” are cards with a value higher than the board). The local player now bet out $10,000, and I retreated into my think tank. I studied how many chips were in his stack, and it seemed like we both had about $75,000 in total. OK, the fact that he bet means he has my hand beat, I figured. However, if he has pocket threes, fours, fives, sixes, nines, 10s, jacks, or a bluff, then I will probably win the pot by raising all-in: and even if he does call with one of those hands, I’ll be a mathematical favorite to win the pot. If he has three-of-a-kind, then I’ll be in trouble — a bit less than a 3-to-1 underdog. Still, it is much more likely that he will have to fold his hand if I raise his last $65,000 in chips. 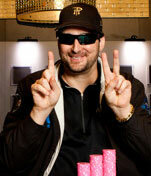 Traditionally, the pros move all-in with two “over cards” and an ace-high flush draw. After a minute, I moved all-in, and I was called instantly, yikes! He called so many chips so quickly that I knew my opponent was going to show me three-of-a-kind. In fact, he had three eights, and now I needed to hit a diamond. The turn card was the 6c, and now I needed a diamond for a flush or a nine to complete a straight. But alas, the last card was the Qs. There I sat, on the rail, stunned, it had happened so quickly! If only I had read my opponent for trips, I would have still been in there, because I wouldn’t have moved all-in. What do pros traditionally do with two over cards and an ace-high flush draw?